ALMOST everybody is addicted to the digital world of connectivity. Only a handful can dare say that they are not dependent on the Internet or the connectivity that comes with the digital age. To those not convinced that they are addicted to technology and the Internet, they should try asking themselves a few questions. When was the last time they accessed the computer to search for something through Google? When was the last time they accessed Facebook or Whatsapp to stay connected? How long have they gone without getting “an anxiety attack” without having their handphones with them? If an uneasy feeling creeps into them without having their computers or mobile phones with them, then the chances of them being reliant on the digital world is high. If they are lost at work without “Mr Google” and feel handicapped, then they are hooked on the digital world. From the hundreds of people I know, only two do not carry a mobile phone with them. One is a seasoned lawyer while the other is a retired factory manager. They are exceptions to the norm. The digital age is here to stay and grow. The advantages of digital connectivity in terms of accessing instant information and staying in touch with others seamlessly are just too great to be without. These days, even people in their late 50s and 60s are active users of Facebook, which they see as critical touch points of their lives with others. The instant response to their postings is a gratification of sorts. These are new touch points that they would normally not be able to enjoy without digital connectivity. However, there is a downside to this digital addiction in both the social and economic sense. There is a book going into the details of how more people are depressed without digital connectivity, how people have gone berserk without having access to Internet connectivity. This is one of the many social downsides of the digital age. However, more shocking is the unconventional work ethics, sexual harassment and culture of idolising individuals that have become rampant with the rise of the digital economy. Last week, the former chief executive of the Malaysian Global Innovation and Creativity Centre (MaGIC), Cheryl Yeoh, revealed that she was a victim of sexual assault by a venture capitalist, Dave McClure, three years ago. The revelation only came after The New York Times reported that McClure had stepped down from 500 Startups following allegations of sexual harassment against him. 500 Startups is a Silicon Valley-based early-stage venture fund and seed accelerator. Generally, the principals of venture funds tend to exert their influence over those seeking their money. It is rampant in the world of the new economy where funding from banks is not easily available. Banks would want to see profits and a strong balance sheet before they lend money to start-ups. Start-ups in the digital economy rarely have both financial elements. Yeoh said that she did not come public with the incident earlier fearing that many would not believe her. She also did not want to jeopardise the business venture between MaGIC and 500 Startups. McClure is not the only venture capitalist who has faced the brunt of unethical work practices. Travis Kalanick, the founder and prime force behind ride-hailing app company Uber, has also been forced out by shareholders after a series of scandals in the company. Among those who complained against the work culture of Uber was software engineer Susan Fowler Rigetti, who in her blog posting stated that the company’s work environment was hostile towards women, leading to many of them leaving. The hostility went beyond sexual harassment. It was even to the point of the women not getting leather jackets as their numbers were small compared to the men who had received theirs from the company. Because the number of women working in Uber was small, the company, which is touted as the most valuable unlisted new economy entity, could not get the discounts required and hence did not order the leather jackets. In a company engaged in the old economy of brick-and-mortar businesses, such reasoning would not have been tolerated. But it has happened in Uber, where Kalanick held a position so strong that the way he managed the company was not questioned. Hero-worshipping the founders is quite common in new-economy companies. Whatever the founders decide is not questioned. It has come to the point where even when deals are concluded at lofty valuations, hardly any murmurs are raised. Jeff Bezos of Amazon purchased a grocery chain, Whole Foods Market, for US$14bil two weeks ago. Nobody batted an eyelid or raised any questions as to why a new-economy heavyweight was buying into a matured company in an industry that was facing huge challenges because of Amazon. Amazon, with its online shopping platform for anything from books to groceries and even movies, has disrupted the retail industry. The likes of Wal-Mart and Tesco are reeling from the growing dominance of Amazon. So, why is Amazon buying into a grocery chain operating in the industry that it is destroying? Nobody knows the answer. They only rely on the faith that Bezos can do no wrong. Blind faith is the biggest downside to the digital economy. 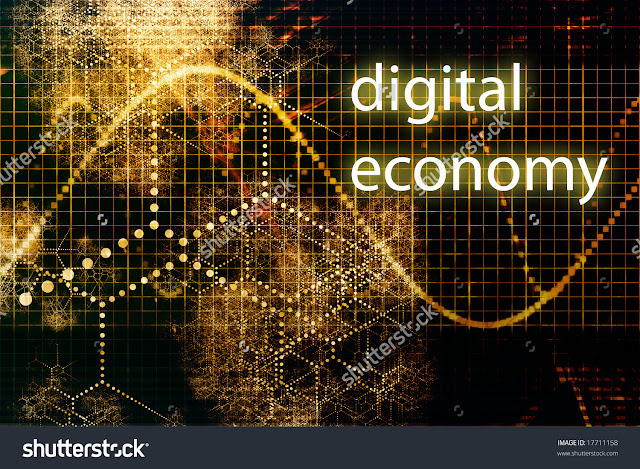 Digital economy companies tend not to give dividends and spend a lot on research and development under the excuse that the business is still growing and needs all the financial resources. Investors believing that mantra follow blindly. They are encouraged by the rising share prices even though there are little fundamentals. One day, such blind faith will lose its lustre and the price will fall. Only then will investors realise that the old-fashioned way of valuing companies is still way better.